I have had the great pleasure this week of receiving a copy of a new book by Julia Deering called The Playful Parent. If you haven’t heard of it yet I am sure you soon will. The Playful Parent is a fantastic book full of ideas around play for the under 5’s. It is packed with inspiration for engaging children with playful chores and encouraging then to play whilst you do chores. It has sanity saving ideas, crafting ideas, guidance and advice around setting up play quickly and lots, lots more. My favourite bits of the book were the ‘invitations to play’ Julia shares. She makes an important point that children find play invitations everywhere such as in a puddle, in their food! on spotting a worm in the ground and we should embrace this natural playfulness. Ideas for invitations to play may include putting a box of dress up clothes beside a full length mirror, a few books in a basket on the floor, tidy shelves and open boxes of themed toys. Sounds inviting and easy to access doesn’t it! With the school holidays fast approaching this book has given me lots of inspired ideas. Julia Deering was a primary school teacher, she is a prolific parenting blogger and journalist and a play session leader at the Geffrye museum. She clearly knows her stuff. I would really recommend this book. 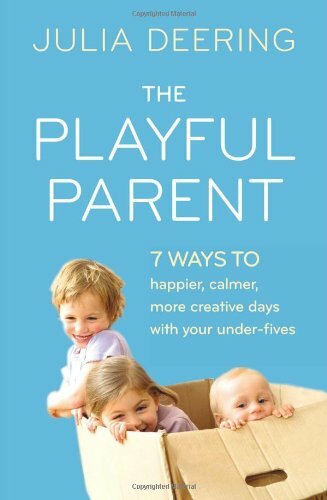 In order to win a copy of The Playful Parent you simply need to tell me in comments below you favourite way to play with your child? A winner will be picked at random from the comments left on 27/6 at midnight. Good luck & keep playful! Next Post What my sight means to me. I love the sound of this book and would love a copy. I enjoy sitting back and letting my children take the lead with play. Sometimes they really surprise me with their vision and insight. This is shown by the way a stick has a million uses and I have a million sticks or so at my front door! I would love this book 🙂 I can already tell! ..I’m still considering myself a new mom, my daughter is 20 months. It’s just the two of us at home, and recently my favorite thing to do with her is draw/color… I will put out a tub of scrap paper (including junk mail), coloring books, crayons, and sometimes I throw in pens or pencils 🙂 she absolutely loves it so of course I do as well! I love outdoor play. Kids find joy in the most mundane things and something like a feather can provide hours of joy. My favourite way to play is to develop an interest they have or take something from a book e.g. we might make a fairy house in the garden if we have been reading stories about fairies and then we might ‘write’ fairy stories. I think all play that is child led can be deep and meaningful to the child. Cardboard box and a few blankets! Cooking as it is something we can do together and it is never too soon to learn about food. It covers colours, names of ingredients, and warning of not touching cookers etc. I am now following Julia Deering on Twitter. My baby is only 3 months and starting to pick up on different sensations. I have a bag full of materials with different textures and sounds – her face lights up when she discovers something new! I love to build cubby houses inside the house, we have picnics inside our cubby house and play with toys/teddies/dolls 🙂 Great fun and great when its cold/raining outside. I like it when we make a den and climb inside and that den can become a rocket, a train, an aeroplane – anything that there imagination takes them! We love getting some chairs and a load of old blankets and making a camp. We’d love to win a copy 🙂 My ten month old baby and I love to play the piano and sing together. I take him up on my knee and he bashes away at the keys in delight. His favourite song is “the wheels on the bus.” He loves it so much that I just make up loads and loads of verses- there are loads of very random noisy things on our bus!! We would love to win a copy, our 13 month old son loves to play with brightly coloured pom-poms, there are hours of fun in taking them in and out of a gift bag, posting them into drawers, pushing them through the cot bars, or hiding them under cushions then finding them again, and of course they are small enough to crawl with easily – I’m forever finding them in the most random places! Lots of books – my son loves them! I also make a lot of bits and bobs, out of old ‘junk’ for my son to play with, he’s almost a year old and just really getting into everything! A very fun stage! To be honest, he’s happy with a wooden spoon and cardboard box if he can bang it and make lots of noise! My kids love doing nature trails in forests / countryside. I’d love this. I’m a bit stuck with our three year old right now who is an only child. Seems to have got into a rut with only wanting to play with one toy, or watch Frozen! Could do with some creative play inspiration. i love to play hide and seek.its hilarious. Difficult to choose just 1 – but my absolute favourite way of playing with my 16 month old is to dress up in silly clothes from the dressing up box & dance around the room to cheesy music! We both love it!! WE LOVE TO PLAY IMAGINATION GAMES ANYTHING MY LITTLE ONE FINDS WE MAKE A GAME OUT OF. My twin girlies love to play in their ball pitt! I like to sing everything we do together! We love tickles with silly games and rhymes.